Wait—there’s a way to get an extra six months after the April 15 deadline to file your tax return without paying penalty fees? Where have you been all my life, tax extension? Tax Day is officially April 15 for most states (residents of Maine and Massachusetts have until April 17 due to Patriot’s Day and Emancipation Day), but the IRS will give you a six-month extension if you request it by Tax Day. 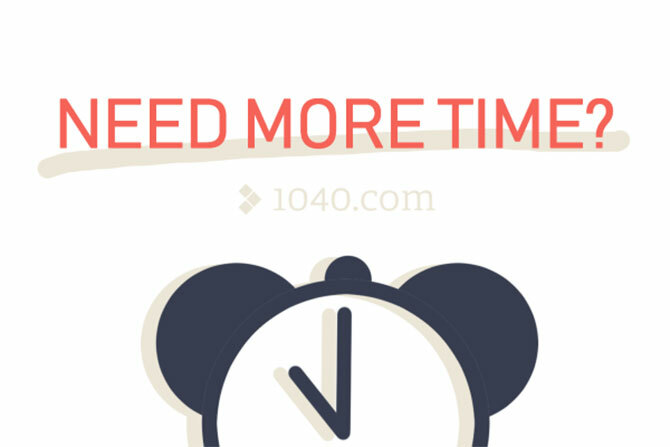 Best yet, you can get your extension from right inside 1040.com’s tax walkthrough! File an official request, pay the fee, and boom: Six extra months to file. You can even file your federal and state returns for free if you get the extension through 1040.com, no matter what your tax situation looks like! Extensions give you extra time to file your tax return, but they don’t give you extra time to pay any taxes owed. While your tax return won’t be due until mid-October if you file an extension, tax bills don’t get the extra wiggle room. If you’ve been putting off filing your tax return because you’re afraid you can’t pay your tax bill, don’t delay any longer—read our blog post on what to do if you can’t pay your taxes and get started on your tax return ASAP! Why file an extension instead of just filing now? So if an extension doesn’t give you extra time to actually pay your taxes, why would anyone want an extension? Simple: Sometimes, you’re just not ready. Maybe you’re a freelancer who’s still waiting on info from a client, or maybe you’ve still got some numbers to crunch before you sit down to do your taxes. Tax reform may have you confused (and if that’s the case, have we got a blog post for you! ), or maybe life has thrown you some crazy situations. The potential reasons go on and on; the important thing is that you can get an extension if you need it. Whatever you do, get the ball rolling! If you can get your taxes done before April 15, go for it! For the rest of us, remember to file your extension by signing up or logging in at 1040.com and you can come back any time between April 22 and October 15 to finish the job for free—including state returns!